Posted on 06/07/2016 by Jeremy Bailey	in Around Town and tagged Atwater Brewery, Beer, beer festival, Confluence Brewing Company, craft brewery, Dogfish Head, food pairing, National Building Museum, Parish Brewing Co., SAVOR, SAVOR 2016, Southern Tier Brewing Co..
Stouts. Porters. As I walked the National Building Museum’s expansive floor, pausing at various brewery tables to read the cards flaunting a beer name/style and its tasty looking small bite pairing, it struck me. There are a lot of stouts and porters for a summer event. And that is fine by me. 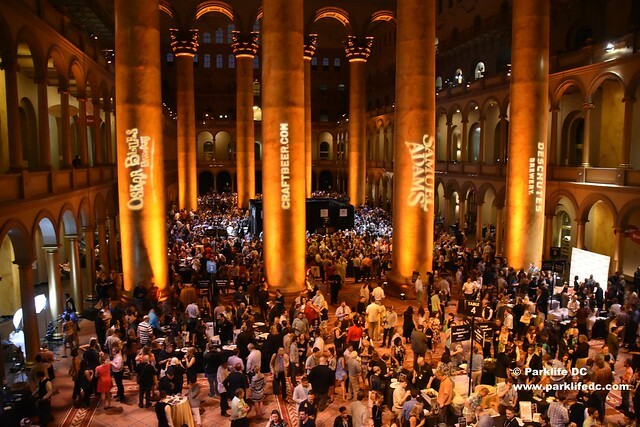 At the 9th Annual SAVOR (An American Craft Beer & Food Experience) on Friday, June 3rd, if I had counted all the beers I tried, I suspect 75% or more were on the dark side. Of the 76 craft breweries on hand (from 28 states), 26 of those chose to pour a stout (16 breweries) or a porter (10). Compared to the far more common approach to feature IPAs (33) and other lighter, summer styles.